Vegetarian or not, you will crave for more when you try Kare Kare made with Knorr Kare Kare Mix. Talong, sitaw, pechay, puso ng saging! Bagoong please! 1 Let’s begin by getting your pan nice and hot over medium heat. Pour some oil and throw in the banana heart, eggplant and sitaw. 2 Pour dissolved Knorr Kare Kare Recipe Mix and peanuts. Allow to simmer until thick and vegetables are cooked. 3 Add pechay, then simmer for a minute and that’s our dish! 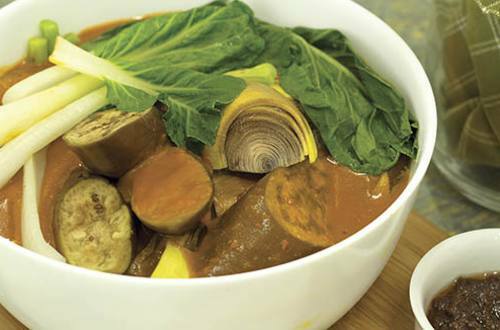 You will surely change your mind when you try this Vegetable Kare-Kare. Serve with bagoong, it’s a true winner!